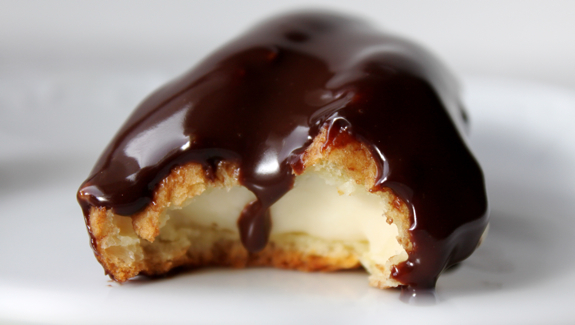 Vanilla Eclair with Chocolate Ganache for French Fridays with Dorie - posted on the new site! Well friends, it has finally happened. 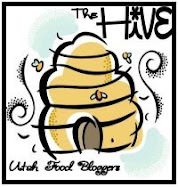 I've moved on over to my very own URL at PheMOMenon.com! I hope you'll join me over there for more fun and lots more to come. 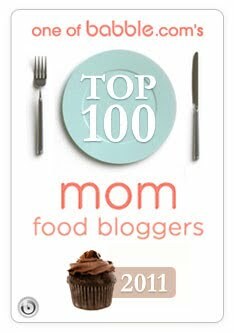 I'll still be bringing lots of recipes and goodies, but I'll also be sharing more of the 'Mom' side of things as well. I hope that you'll update your bookmarks and keep visiting me because I've got a lot of fun projects that have been in the works and are about to start launching. 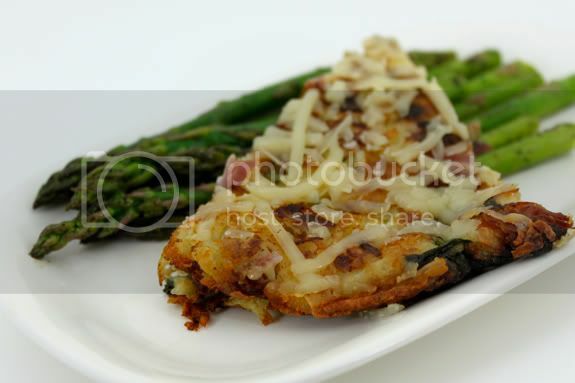 Rösti. Seriously, I think that is just a fun word. Don't ask me why... maybe it's because with those little dots over the 'o' it looks like the 'o' is ready to eat a slice of this ridiculously easy and yummy dinner, lunch or breakfast. I don't know where this idea has been hiding my whole life either, but it was so good, everyone loved it and dinner was ready in 15 minutes flat. So. 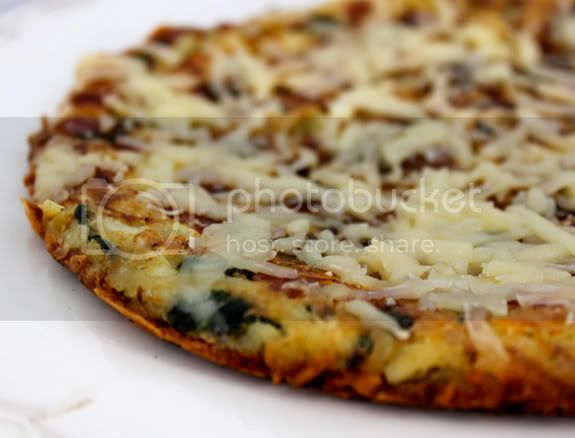 It is basically a thinnish, pan fried, potato pancake with extras mixed in - ham and swiss cheese and spinach in this particular case. You could vary what you mix in there however you like I'm sure, but those are ingredients I generally have on hand. 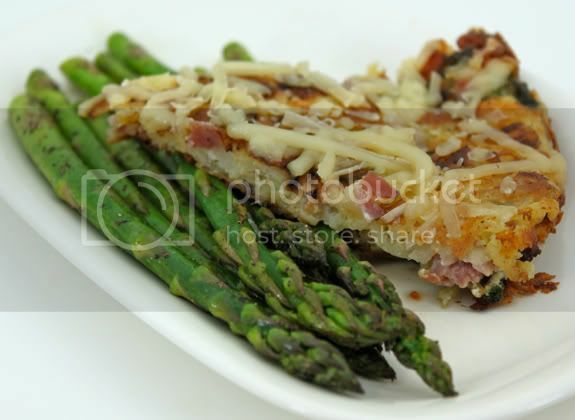 For a double bit of green with our dinner I also quick pan roasted some asparagus. Including all the prep (which isn't much) and cooking time on everything, seriously, who wouldn't want dinner ready in 15 to 20 minutes tops (including very little to clean up). Genius. Speaking of genius moves... PheMOMenon is being redesigned in the next couple of weeks, so I hope you'll stay tuned for lots of fun changes! I'll be taking a little break in the meantime while all those details are worked out, but I'll be back soon! Heat 1 tablespoon of olive oil in a large skillet (9 to 10 inch) over medium-high heat. Pour the potato mixture into the pan and cook until golden, about 6 to 7 minutes. Cover the pan with a plate (or use the pan lid) and flip the potato cake out onto the plate by holding it over the pan and flipping the pan over (like you would a cake out of a cake pan onto a rack). Add the remaining 1 tablespoon of olive oil into the skillet and slide the potato cake - uncooked side down - back into the pan. Sprinkle the remaining cheese onto the top (cooked) side of the cake and cook the cake until golden, about another 5 to 6 minutes and the cheese is melted. Remove the cake from the pan, cut into wedges and serve warm. Heat the olive oil in a skillet over medium high heat. Add the asparagus spears, cook 1 minute moving the spears around the pan gently and season with the salt and pepper. Cook 1 to 2 minutes more until bright green, still crisp and hot. Sprinkle with a little lemon juice and serve hot. There are certain recipes that I've never made that have absolutely nothing to do with difficulty or ingredients. 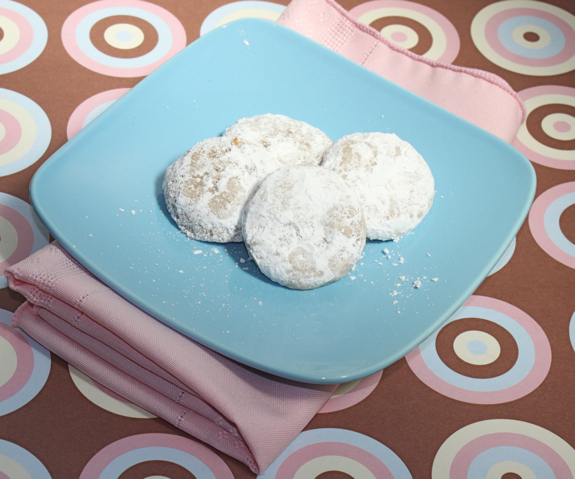 The Pecan Powder Puffs (aka Mexican Wedding Cookies) for this week's Tuesdays with Dorie, chosen by Tianne of Buttercream Barbie, happen to be one of those recipes. 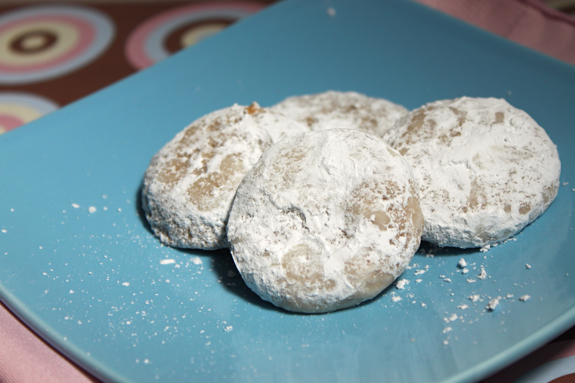 In fact, I've been ignoring the fact that a really easy recipe for these cookies has been sitting in the book. I was doing a good job of ignoring it up until now too. They are dangerous. Severely dangerous. Sigh. Years ago, when I first moved to Utah, I was working in a law firm where the secretaries all loved putting treats out on their desks during the holidays. I was working in the firm as a runner (basically a gofer, just like it sounds :) and therefore was exposed to all the various treats hiding around all three floors of the office. These happen to be the only treat I remember. Anyway, one of the secretaries always brought a huge tub of these cookies and every time I went by I couldn't resist grabbing another one. When you figure that in an 8-hour shift I went by her desk at least 8 times... well, you can imagine the problem. I fully justified it because working as a runner, on a 3-floor office I figured out that I was walking about 40 miles per week (no joke!) and therefore my 19-year old body could eat whatever the heck I wanted and get away with it (and did). Fast forward a generous handful of years and that is no longer the case. 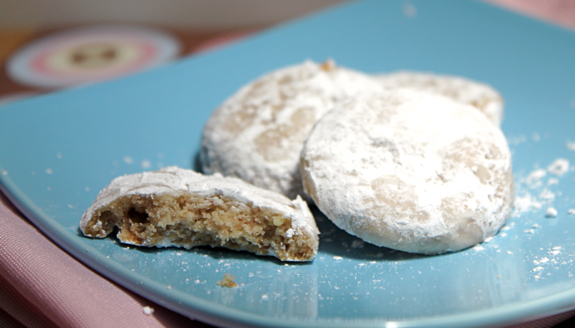 I cookie that is cobbled together of pecans, sugar, butter and a bit of flour, then dipped in more sugar before eating and you can imagine that having these babies in my vicinity is a recipe for major weight gain. Therefore, until today, I had never made them. Now, my cookies didn't turn out as puffy as the cookies I've usually seen, but I expect is has something to do with oven temperature or high altitude. Bottom line, they were still incredibly tasty and crumbly and melt-in-your-mouth delightful, so I really didn't care. And guess what? I was right, they are dangerous, because the batch is already over half gone... and I'm pretty sure I'm the only one who has been eating them. For more delicious cookies, visit the TWD blog and LYL post.